ThoughtFarmer 7.1 Jalapeño helps you spice up your intranet content with beautiful images and sleek, colored calendars. But this release isn’t just good looking, it’s also really useful! Authors will love how easy it is to add images to their posts, IT will be very happy setting up user management with SAML and Active Directory integrations, and users will appreciate being able to login with existing systems passwords. One of the biggest challenges of having a beautiful looking intranet is creating great looking content that displays well in multiple formats. ThoughtFarmer 7.1 totally re-imagines image cropping, making it really simple for users to add great looking images. We added drag & drop and zoom tools that are readily accessible from the page editing interface. The tools allow authors to decide how the image will display in various formats across the intranet — including news feeds, the home page carousel, the Pinterest-style card layout, search results and section pages. 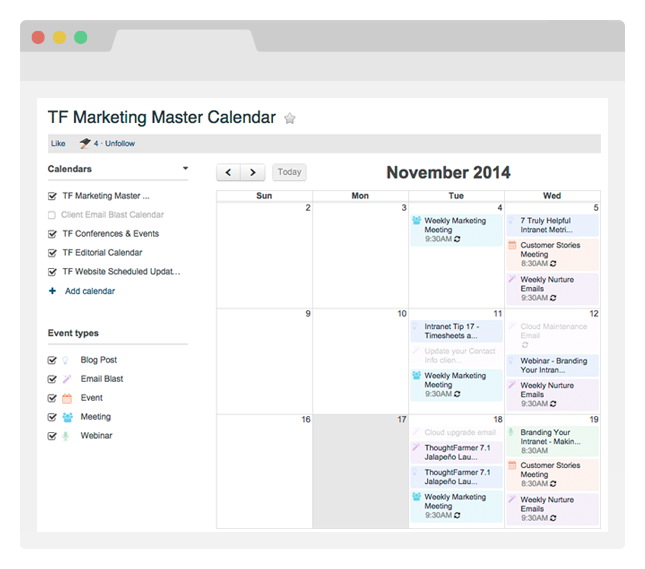 Shared calendars are one of the most popular features in ThoughtFarmer. In ThoughtFarmer 7.0 Matcha, we added a ton of great calendar features — including custom events, recurring events, calendar subscriptions, and multi-calendar view. In 7.1, we’ve made calendars even better with customizable colors for each event type and a sleek look. Existing clients: Switching to the Employee Directory Connector with SAML is in beta release and is currently only available for ThoughtFarmer Cloud. We will need to review your current setup and discuss technical requirements before confirming switchover eligibility. Please contact Client Services for availability and requirements.